The splendid new disc features a New York / New Orleans hybrid: Kellso, trumpet; Munisteri,guitar / vocal; Evan Christopher, clarinet, and Kerry Lewis, string bass. And they groove spectacularly. They are a Marvel of Nature, an expansive sonic orchestra that masquerades as a tidy improvising quartet. They model democracy in swingtime, where each of the four players is audible, recognizable, playfully sharing musical heart-truths. In their native habitat, they are small enough to fit in a New York corner (The Ear Inn is a compact place), where they reverberate not loudly but mightily. Their mailing address is the intersection of Translucence and Stomp, just off Lyrical. And although the Official Jazz Historians try to force music into restrictive boxes, The EarRegulars create timeless and limitless music, joyous lyrical improvising. One hears the Ancestors (who are grinning) but this band is a triumph of the Here and Now. They cavort in the present moment rather than offering shelf-stable, freeze-dried jazz repertory. Their musical conversation is collaborative joy: one hears four creative individuals, easily amused, sweetly competitive, extending each others’ thoughts, capping each others’ jokes. The pleasure, not only mine, of witnessing The EarRegulars live, Sunday after glorious Sunday, has been the feeling, “This is the way I imagine musicians play when all distractions and tensions are removed, when the ideal audience fully understands them, when they are surrounded by love, free to express themselves fully. 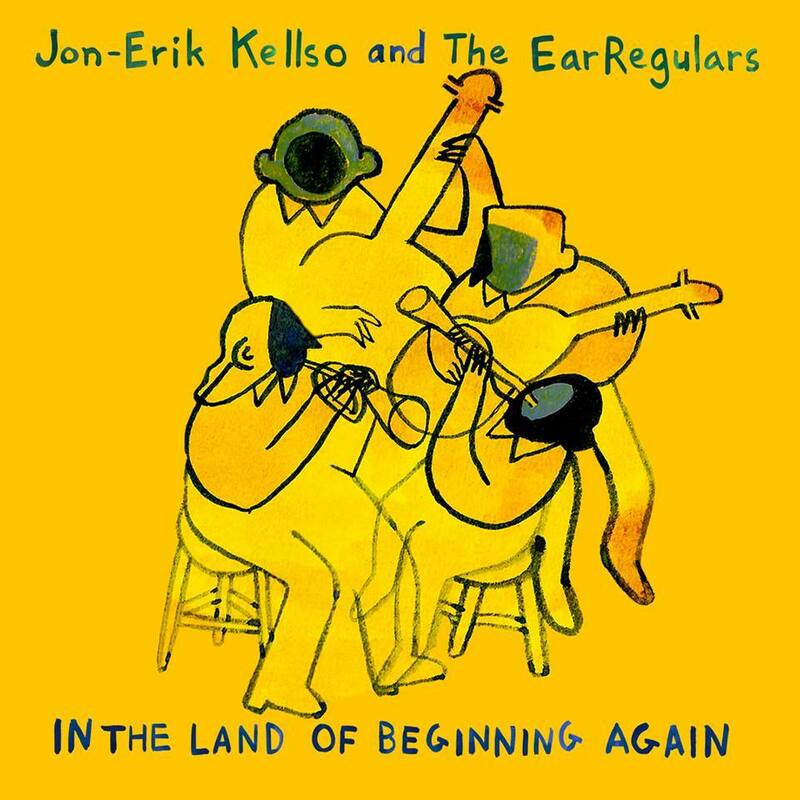 What a blessing this is.” This bicoastal version of the band offers its leader, Jon-Erik Kellso, and his inspiring colleague, Matt Munisteri, alongside New Orleans heroes Evan Christopher and Kerry Lewis. Their sounds need no explication, merely your most fervent close listening. Each track has beauties it reveals on the third hearing, the twentieth, their approach a beautiful oxymoron, a delicate ferocity. And their flexible, playful approach reminds me of what Ruby Braff would do with any gathering of musicians: scatter them on the floor like puzzle pieces and reassemble them in surprising, fluid ways. So this quartet becomes a series of trios, duos, and solos, never predictable, never the Same Old Thing of ensemble-solos-ensemble. And the sounds! The repertoire is gorgeously uplifting. Even though I have heard The EarRegulars take the most familiar song and make it new, this CD is full of delights. Jon-Erik’s OUT OF THE GATE has to be the soundtrack for an animated film, LITTLE JAZZ! — where superhero Roy Eldridge vanquishes the enemies of Swing. His EARREGULARITY (something to be sought out, not feared) is a 2015 ragtime dance. Evan’s SURRENDER BLUE is so touching! I hear it as lullaby superimposed on love song, the most tender music imaginable. The other songs have wondrous associations: the Casa Loma Orchestra, Benny Carter, the Hot Five, Ivie and Duke, Louis and Papa Joe, Fate Marable . . . all memorable but rare. I think of these sounds as healing defense against the wounding clamor of the world, reminders that the cosmos will welcome us. Start with IN THE LAND OF BEGINNING AGAIN – sung so soulfully by Matt – and you will agree. I am honored to live in a time and place where such joy is not only possible but freely offered. Bless The EarRegulars and may they prosper. Forever. Although I find it inconceivable that anyone encountering JAZZ LIVES would be unfamiliar with the EarRegulars, here they are — at least three-fourths of the latest combination — onstage at the Louisiana Music Factory. 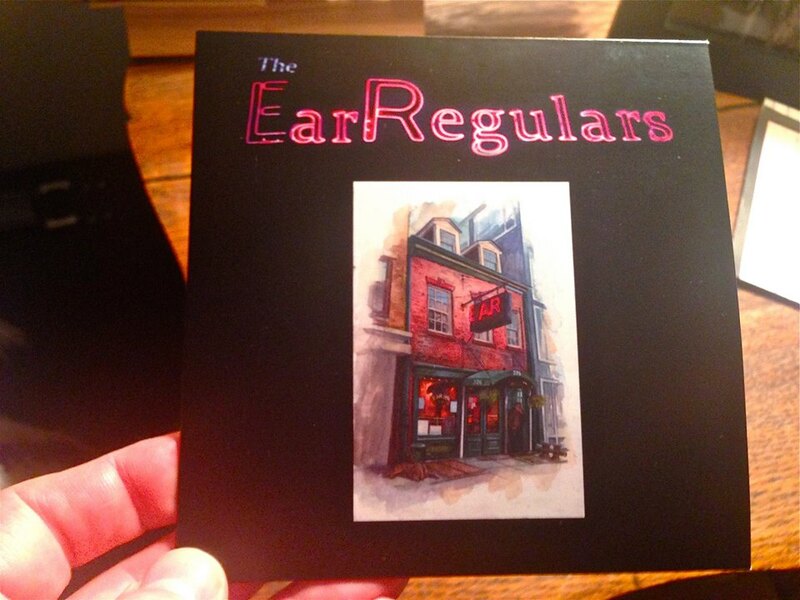 Of course, you can purchase the disc from Jon-Erik at The Ear Inn or at other gigs, or visit here. It is on Amazon as a download, and probably iTunes. And available direct from Jazzology and Louisiana Music Factory. One way to get a double dose of this joy is to visit Symphony Space at Broadway at 95th Street in New York City on November 2, 2015, at 7:15 PM for the Sidney Bechet Society’s season finale, “Ear Inn, Uptown!” which will feature Jon-Erik Kellso, Evan Christopher, Matt Munisteri, singer Brianna Thomas, and others in a jam session saluting the jazz scene at The Ear Inn, the city’s oldest bar. Tickets $30 in advance via mailorder from the Society, and $35 at the box office: Peter Norton Symphony Space, 2537 Broadway at 95th Street, New York, NY 10025. (212) 864-5400. We know that people can contribute greatly to the health and vitality of an art form without being artists themselves, and Eric was one of those people. His distinguishing characteristic, to me, was a determined focus on an ideal: the kind of music his hero Sidney Bechet both played and embodied: hot, intense, impassioned, reaching back to a New Orleans past but simultaneously alive in the present. The Sidney Bechet Society is honoring its president and founder with a concert this coming Monday (at the late-twilight hour of 7:15) at Symphony Space, which is at 95th Street and Broadway in New York City. It features the clarinetist Evan Christopher, trumpeter Byron Stripling, pianist Bobby Floyd, string bassist Kelly Friesen, and drummer Marion Felder. I know they will fill the room with music that both celebrates and mourns a man wholly devoted to the sounds that have so often healed us. Here is the link where you can purchase tickets. Like the music he believed in, Eric was determined — devoted to an ideal. And that ideal will show its durability, its joy and ferocity this Monday night. Svetlana Shmulyian, Tom Dempsey, Rob Garcia, Asako Takasaki, Michael Kanan, Michael Petrosino, Joel Press, Sean Smith, Tardo Hammer, Steve Little, Hilary Gardner, Ehud Asherie, Randy Reinhart, Mark Shane, Kevin Dorn, James Chirillo, Brian Nalepka, Dan Block, Danny Tobias, Matt Munisteri, Neal Miner, Catherine Russell, Jon-Erik Kellso, Lee Hudson, Lena Bloch, Frank Carlberg, Dave Miller, Billy Mintz, Daryl Sherman, Scott Robinson, Harvie S, Jeff Barnhart, Gordon Au, John Gill, Ian Frenkel, Lew Green, Marianne Solivan, Mark McLean, Dennis Lichtman, Tamar Korn, Raphael McGregor, Skip Krevens, Andrew Hall, Rebecca Kilgore, Dan Barrett, Scott Robinson, Pat O’Leary, Andy Brown, Giancarlo Massu, Luciano Troja, Rossano Sportiello, Randy Sandke, Harry Allen, Dennis Mackrel, Joel Forbes. 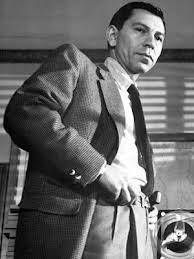 And I saw them at the Back Room Speakeasy, the Metropolitan Room, Smalls, the Bickford Theatre, the Ear Inn, Symphony Space, the Finaldn Center, Jazz at Kitano, Jeff and Joel’s House Party, Dizzy’s Club Coca Cola, Jalopy Theatre, Casa Italiana, and Zankel Recital Hall. T.S. Eliot had it wrong. Just another average jazz-month in New York. P.S. This isn’t to slight my California heroes, nay nay — among them Marc Caparone, Dawn Lambeth, Carl Sonny Leyland, Clint Baker, Jeff Hamilton, Chris Dawson, Marty Eggers, Katie Cavera, Kally Price, Leon Oakley, Mal Sharpe, Tom Schmidt, John Reynolds, Melissa Collard, Ari Munkres, GAUCHO, PANIQUE, Bill Carter, Jim Klippert, JasonVanderford, Bill Reinhart, Dan Barrett . . . . I don’t know how the singer and ebullient force of nature Catherine Russell would do in combat against Lex Luthor or a fleet of intergalactic starships. But I do know that she is the sworn enemy of Gloom and Dullness, a tireless fighter for Joy and Swing. She proved this again last night at Symphony Space in a concert sponsored by the Sidney Bechet Society. With her were some of her usual comrades-in-arms: Matt Munisteri (guitar and musical director); Mark Shane (piano); Jon-Erik Kellso (trumpet); Dan Block (clarinet and tenor); Lee Hudson (string bass); Rocky Bryant (drums). Catherine is not only a splendid singer, with an unerring internal pulse and gift for melodic invention; she moves easily through a variety of moods in the course of an evening. In addition, she is a happy embodiment of living swing: flashing a gleaming smile, joking with the audience, and dancing all over the stage. She truly has a good time, and it never seems artificial. Rather, she is delighted to be there to make music for us and her pleasure comes through, whether she is picking just the right tempo for a bluesy slow drag or spontaneously interacting with an audience member. After an instrumental exploration of BLUES MY NAUGHTY SWEETIE GIVES TO ME, Catherine came on to offer a varied program. A special pleasure was observing a mature artist who has fully internalized a variety of influences — from the fierce women blues singers to Motown queens, from the dancers at the Savoy Ballroom to gospel choirs, all these influences seamless and fully developed within her own personal style. Listening to Catherine, one never feels, “Now she’s becoming this performer or this one; now she’s acting out that recorded / seen performance.” No, the result is fully in blossom — homage to the great influences before her but also singularly her own. When she approached an early-Twenties blues, SHAKE THAT THING, it owned property in several universes — not only the kind of music one would grind to in 1923 Chicago but a sultry call-to-shake entirely appropriate ninety years later. Her other blues performances — one about financial distress (the concert was, after all, held on April 15), her own evocation of Esther Phillips’ AGED AND MELLOW, and Dinah Washington’s ominious MY MAN’S AN UNDERTAKER — were just as dramatically compelling. She wooed us with AFTER THE LIGHTS GO DOWN LOW and then hilariously dismissed us with I’M CHECKIN’ OUT, GOOM-BYE. Other classics that Catherine has made her own — an encore of KITCHEN MAN, WE THE PEOPLE, standards SOME OF THESE DAYS and DARKTOWN STRUTTERS’ BALL — had their own joyous light. In twenty songs, she turned herself and her personality to the light as many ways, but each time we recognized her essence: soulful, experienced, thoughtful, deeply feeling and deeply amused. Visit Catherine’s website, Facebook page or Facebook music page. And for the immediate future . 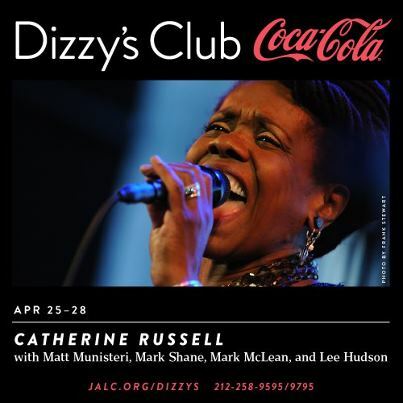 . .
Catherine will be appearing with Mark Shane, Matt Munisteri, Lee Hudson, and Mark McLean at Dizzy’s Club Coca-Cola (Jazz at Lincoln Center) for four nights — Thursday, April 25, through Sunday, April 28 — with shows as 7:30 and 9:30 PM. Come and be amazed by Catherine Russell, performing superhuman feats of humanity, humor, creativity, and swing, as if they were easy to do — which for her, they are. 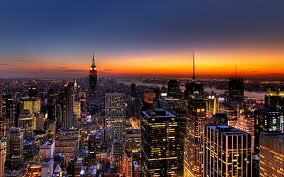 GO WEST (into NEW JERSEY) FOR JAZZ! Even with my much-used GPS glued to the windshield, I get lost easily while driving; certain neurons must not be speaking kindly to one another. So for several years, the thought of “driving to Brooklyn” was stressful. But I have gotten more brave. Now. . . to the next summit . . . conquering New Jersey! But what is life without live jazz? A few days ago, I had the opportunity to hear Mark Shane — Prince of Pianists — sit down at a baby grand piano and saunter through four choruses of IF I COULD BE WITH YOU. 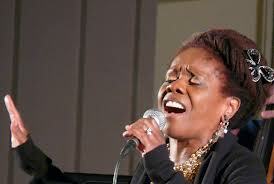 I am going to see Mark and Catherine Russell (and Matt Munisteri, Jon-Erik Kellso, Dan Block, and some rhythmic gents) on Monday, April 15 at Symphony Space . . . but that concert, one I am looking forward to with eagerness, seemed a long way off. Here are the details. Full of jazz-flavored courage, I made the necessary arrangements, checked in with my cardiologist, informed the authorities. I will be driving from Long Island to the Bickford Theatre in Morristown, New Jersey, this coming Monday, April 8, to see and hear cornetist / trombonist Randy Reinhart lead a small band (small in numbers only): Mark, piano; James Chirillo, guitar; Brian Nalepka (back in the saddle again!) on string bass; Kevin Dorn, drums. To keep up with future events, email Jazzevents@aol.com and let them know you’d like to be in the loop — for concerts featuring the Midiri Brothers, Danny Tobias, Bria Skonberg, Dennis Lichtman, Dan Levinson, Molly Ryan, Neville Dickie, Emily Asher, Bucky PIzzarelli, Frank Vignola, Vinny Raniolo, Jon-Erik Kellso, Ehud Asherie, Peter and Will Anderson, Gordon Webster, the DIVA Jazz Orchestra and more. Posted in "Thanks A Million", Bliss!, Generosities, Hotter Than That, Ideal Places, Irreplaceable, Jazz Titans, Pay Attention!, Swing You Cats!, The Heroes Among Us, The Real Thing, The Things We Love, Wow! 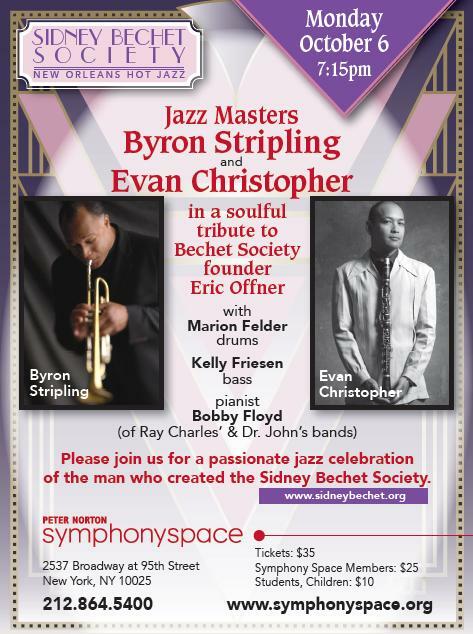 *The Sidney Bechet Society. We haven’t been able to spend Tuesdays with Monsieur Bechet for a half-century, but time spent with his youthful heirs will be just as satisfying. Don’t be left out!